Paris, France, 2 April 2018 - Key officials, diplomats and authorities from France and Malaysia in Paris gathered around HRH Regent of Kelantan, Tengku Muhammad Faiz Petra, for the official inauguration of the ‘Kelantan, Splendeurs d’un Sultanate’ exhibition today. 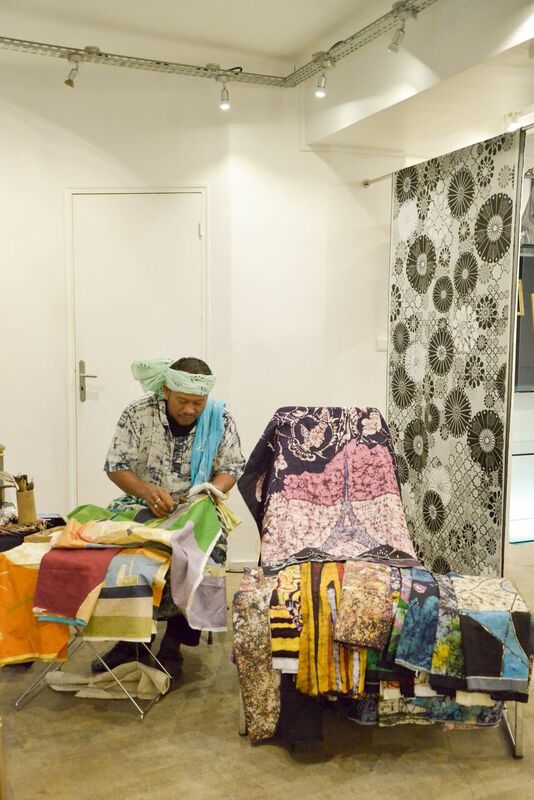 Open to the public, the exhibition runs until 6 April 2018 and presents the art of living in Malaysia through craftsmanship and cultural heritage. It was created with the support of the Malaysian Ministry of Tourism and Culture, the Malaysian Embassy in France, the office of the Sultan of Kelantan, the Kelantan State Museum Corporation, the Faculty of Art and Design, UiTM Shah Alam and Tourism Malaysia. 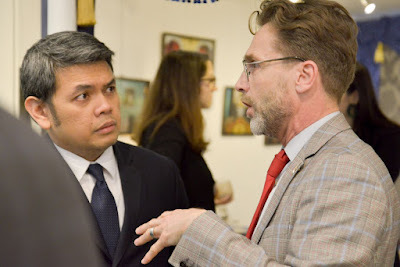 The art pieces from state museums in Kelantan and private collections are presented for the first time in France and to show continuity in their ancestral knowledge, students of the Faculty of Art and Design, UiTM Shah Alam also exhibited their creations in jewelry and textile. Mr Francois Laurent, Deputy Director of International Affairs, French Ministry of Culture and Communications exchanged gifts with Tengku Muhammad Faiz marking 60 years of Franco-Malaysian relations at the event which was also attended by Datuk Ibrahim Abdullah, the Ambassador of Malaysia to France and Haslina Abdul Hamid, Deputy Secretary General - Tourism, Ministry of Tourism & Culture. 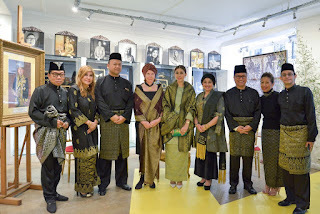 Julia de Bierre, Curator of the exhibition gave Tengku Muhammad Faiz a guided tour on the richness and diversity of the Malay heritage where jewelry, textiles, community art, wedding ceremony customs and a reconstruction of the royal dining room were on display. A short Mak Yong dance of “Mengadap Rebab”, a mixture of theater and dance, classified as an Intangible Heritage of Humanity by UNESCO was performed by dancers from Akademi Seni Budaya Dan Warisan Kebangsaan (ASWARA). 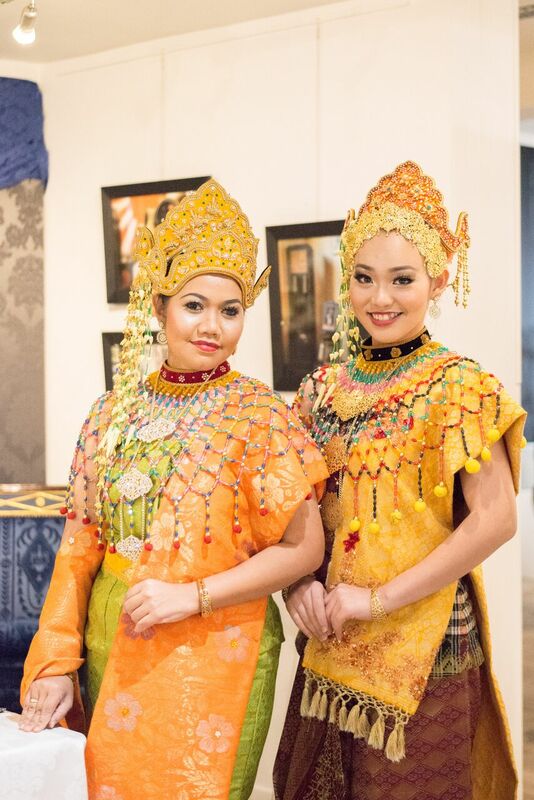 The exhibition is sponsored by the Malaysian Ministry of Tourism and Culture in association with Tourism Malaysia, the Embassy of Malaysia in France, Kelantan State Museum Corporation, UiTM Shah Alam and co-sponsored by Ancom Berhad, MAA Group Berhad and Uzma Group. 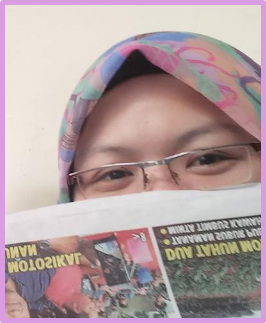 Adlina Borhan, co-founder of the Marketing and PR agency Ab & Artho, the organiser of this exhibition is supported by Julia de Bierre, Curator of the exhibition, Shah Ramli BVBA, design firm, Professor Sulaiman Ghani of UiTM Shah Alam, Rita Aziz and Yaman Ibrahim, photographers. 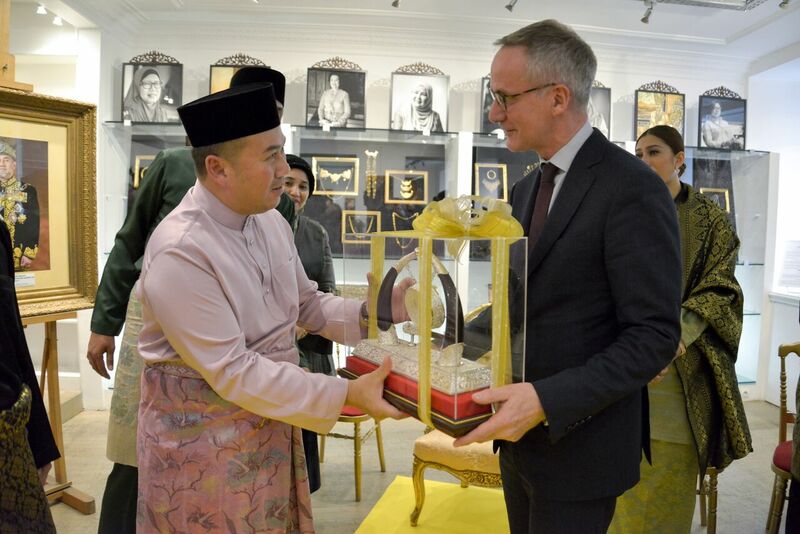 Francois Laurent receiving a Kelantanese silverware gong from HRH The Regent of Kelantan as part of the gift exchange marking 60 years of Franco-Malaysian relations. From left: Haslina Abdul Hamid, Datuk Ibrahim Abdullah, Regent of Kelantan, Datin Seri Haflin Nazri Aziz, Dr. Anesee Ibrahim, Permanent Delegate Malaysia to UNESCO and Francois Laurent from the French Ministry of Culture and Communication. 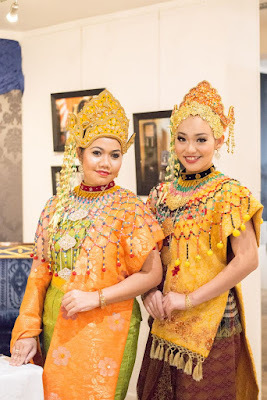 Malaysians dressed in traditional costumes. 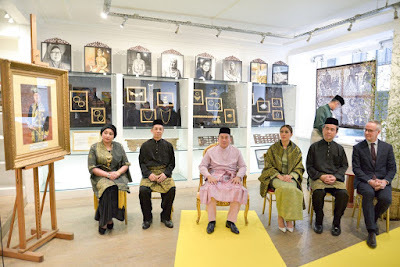 From left: Professor Sulaiman Ghani (UiTM Shah Alam), Dato Siti Hamindah Hamat (Villa Danialla), Nazwan Ismail (Kelantan State Museum Corporation), Julia de Bierre (Curator of the exhibition), Datin Seri Haflin Nazri Aziz, Haslina Abdul Hamid (Deputy Secretary General, MOTAC), Dato Dr. Rizon Juhari (Rector ASWARA), Adlina Borhan (AB & Artho) and Abdul Rahim Haron (Tourism Malaysia). 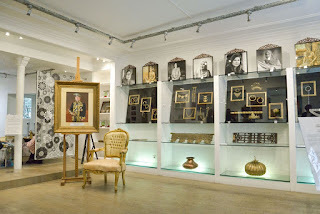 A section of the exhibition displaying artifacts courtesy from Kelantan State Museum Corporation and photographic poster display of inspirational women from Kelantan, photographed by Kelantanese photographer, Yaman Ibrahim. 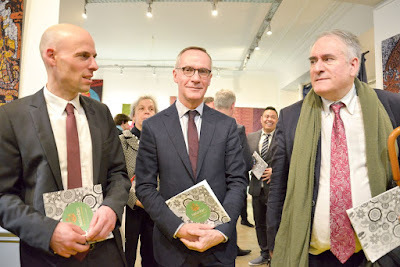 From right, Bruno Flavel , Head of International Relations, Ministry of Culture, Francos Laurent and Franck Hiddinga, French Ministry of Foreign Affairs. Indonesian diplomat, with Eiffel Tower Director of Client Relations, Bob Frank. Kelantanese Artist, Padil Osman showcasing his creative process.